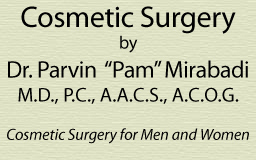 Dr. Mirabadi is a Cosmetic Surgeon and Diplomate of the American Board of Cosmetic Surgery. Her offices are located in Beverly Hills and Los Angeles (San Fernando Valley), California. Dr. Mirabadi was personally trained by the inventor of the Tumescent Liposuction Technique, a procedure that has been featured on ABC's 20/20 and is considered much safe than conventional liposuction. © 2016 Dr. Mirabadi. All rights reserved.